Civil War will balance its dark moments with some superhero humor. The long-awaited Jumanji reboot gets a director. Chris Pine talks Wonder Woman. The Magicians will lean into the horror elements of the books. Plus, more superheroes in DC TV shows, and ridiculously meta Deadpool adverts. Spoilers Now! Making Star Wars have further updates on the oft-rumored presence of Darth Vader in the film. They’re claiming that a crack team of designers has been brought together to recreate Darth Vader’s suit as it appeared in A New Hope for the character’s appearance, and that James Earl Jones will be returning to voice the character (as he had done so for recent appearances in Star Wars Rebels). 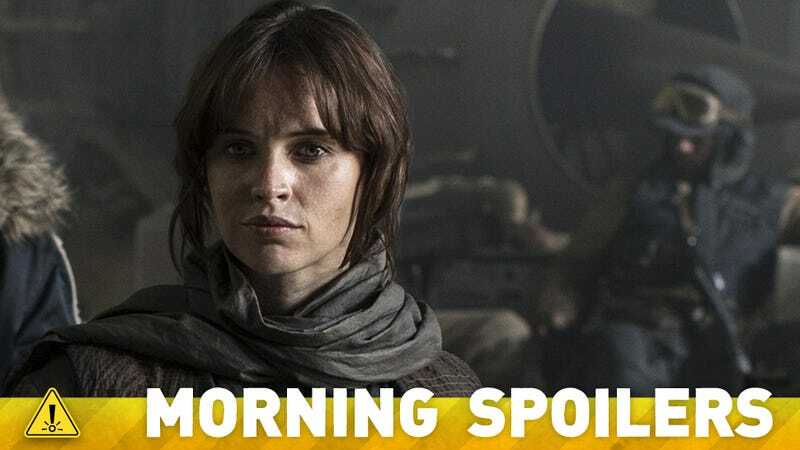 As ever, take rumors like this with an eye for skepticism—but there does seem to be some reason to believe that Vader will play a pretty important role in the background of the film. There’s a good portion of [Civil War] that’s actually funnier than Winter Soldier, because there are characters in that film, that come from worlds where the tone is more comedic. Not all the characters in that movie have the same history as the Avengers. They’re coming at the problem of the film, not embedded with that baggage. They’re not tied to the central arc of the movie with the same motivation as the other characters, so they can be lighter. I think there are a lot lighter moments because there are much darker moments as well. We did have to work very hard at that. Watch ‘Raiders of the Lost Ark,’. It’ll all be right there. I think I’m going to do a pretty hard R .I always remember walking down the edge in Saint Louis when we were previewing [Alien], I couldn’t sit through the film one more time. I walked down the edge into the kitchen scene when John Hurt started to bring up his breakfast. That moment, I realized how pretty scary the film was… I felt a sense of responsibility that I had gone too far because it was extreme. I’m going to try and do that again this year, but much worse. It’s a period we don’t see often; it’s usually World War II. Our costume design is incredible. We have scenes with, like, 500 extras all in period dress. I’d never been on a film with extras casting as beautifully done as it is here. It highlights a really important point. When background casting is done well, it can make or break a scene. I’ve got people in deep background that have entire lives. It’s awesome, it’s actual make-believe land. Defying even its most meta advertising ideas of the past, here’s another billboard that pokes fun at the absurd emoji-based poster that was revealed earlier this week. Skullpoopl! God bless him, it’s his prerogative. I’m a huge fan of what he did, so the [criticism] doesn’t go both ways. I wouldn’t say, ‘What does Frank Miller know?’ I’m so inspired by him and what he achieved and I’m trying to take it further and enrich her. She’s an empowered woman with her own agency, she’s nobody’s victim. The thing about Lev’s books that drew me, because I’m not a huge fantasy fan … everything truly terrifying in these books is what humans to do to each other. So we’re going to lean right into that. Hard. I find the books hilarious, and that’s one of the most fun things to adapt and play with. It’s not pastiche or camp or satire, but the books are very self-aware and extremely funny. The release of writing funny right after horror is … probably the best day job you can have. You’ll see a hint of the Legion on one of our shows. Marc Guggenheim has revealed the title of episode 10, “Progeny”. When a dead body is found in the woods, Mulder and Scully are called in to investigate whether it was an animal attack, a serial killer or just maybe a strange creature as described by eyewitnesses. Meanwhile, Mulder is able to confront some of his own demons about feeling disillusioned with his life’s work in the all-new “Mulder & Scully Meet the Were-monster” episode of THE X-FILES. Additional reporting by Gordon Jackson and Charlie Jane Anders. Image: Star Wars: Rogue One.